Monty Roberts invented join up! When he was 4, he won champion gold in the Junior! He grew up on competition grounds during World War 2! Read this autobiography it's amazing, I couldn't put it down!! 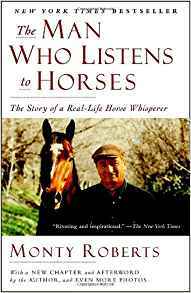 This book is by Monty Roberts who is a horse trainer. This book is about his life and how he his most famous training method: Join Up. I've been wanting to read this for a while. I'll have to work a bit harder persuading my parents. OH! i love this book! one of my fav 5s! This is a great story and amazing that it's true. I really loved it and would love to train with him someday.